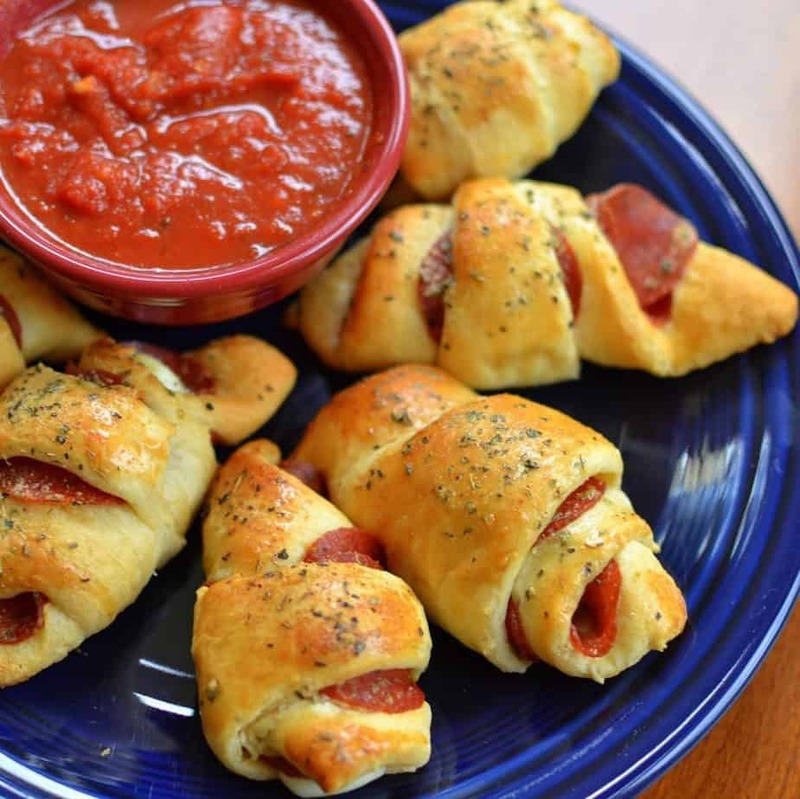 These super easy Pepperoni Crescent Rolls take just minutes to prep and cook using prepared refrigerated crescent roll dough. They are super kid friendly and approved. Well summer is in full force here and that means lots of activities and tons of fun. Quick easy fast suppers and snacks are almost a necessity around here! You have got to keep moving and shaking so you get all the rest of the chores done so you can go swimming, boating, fishing, bike riding and all those other super fun summer activities. 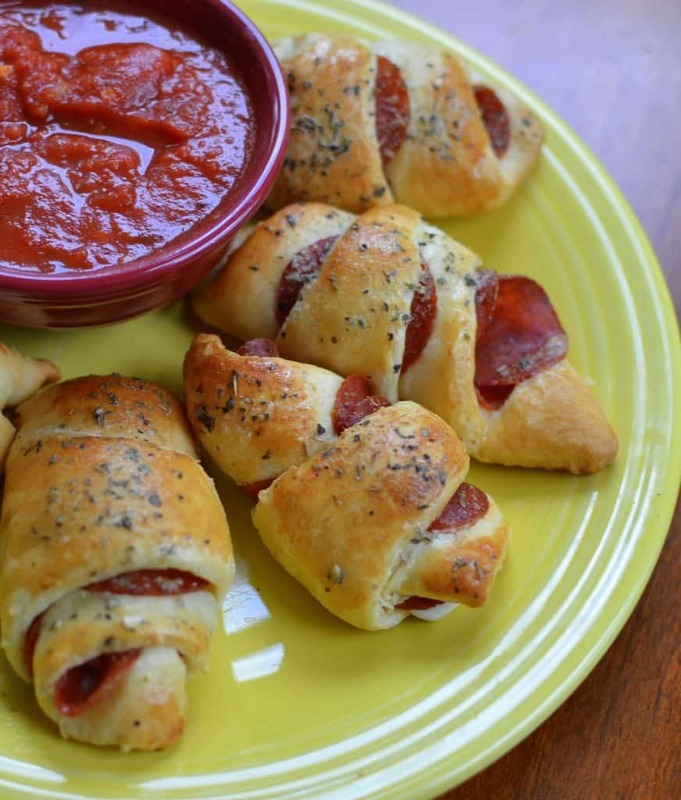 These Pepperoni Crescent Rolls make supper or lunch delicious and quick. There are seven ingredients and most of them you may already have in your pantry. First in a small bowl combine seasonings and set aside. Next beat an egg in a small bowl and set aside. Remove crescent rolls from package. Starting with the wide end place mozzarella stick on the end, place pepperonis along the surface of the crescent roll. Starting with the widest end roll into the most narrow end. Place the crescents on ungreased or parchment covered baking sheet. Brush with beaten egg and sprinkle with seasoning. Bake and serve with warm marinara. Summer is a great time for a little entertaining. Are you doing any this summer? Here are some more delicious summer appetizer recipes. 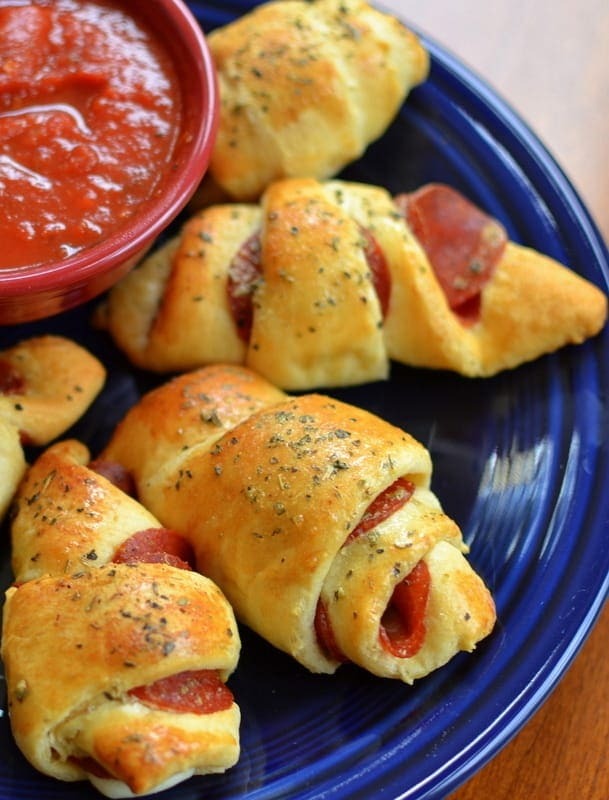 A couple of helpful hints to make these Pepperoni Crescent Rolls Epic! Use name brand refrigerated crescent rolls. I don’t want to sound like a snob but I think they are better. Use dried herbs. With this particular recipe they work better than fresh herbs. Don’t skip the beaten egg it really does make them look AMAZING! Overlap the pepperoni when placing on the crescent rolls. They will taste better and look better. 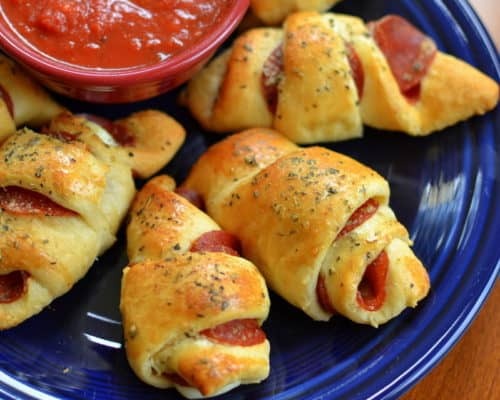 These Pepperoni Crescent Rolls make the best kid friendly appetizers and are prefect for birthday parties and sleepovers! Maybe you and kids just got back from swimming and you need a quick meal before you head out for a bike ride. If you have twenty minutes and a handful of ingredients you can shower love on your hubby and kids. Perhaps the love will come right back to you tenfold. Enjoy my awesome friends! This post was originally published August 20, 2015 and was republished on June 10, 2018 with nee relevant information and pictures. These super easy Pepperoni Crescent Rolls take just minutes to prepare using prepared refrigerated crescent roll dough. They are kid friendly and approved. Combine garlic powder,oregano and basil in small bowl. Remove crescent rolls from package. Starting with the wide end place mozzarella stick on the end, place pepperonis along the surface of the crescent roll. Starting with the widest end roll into the most narrow end. Place on ungreased cookie sheet. Sprinkle with seasoning and brush with beaten egg. Bake for 15 minutes or until golden brown. Serve with marinara. How man does this recipe make with 2 packages of crescent rolls? It makes 16 croissants. I would say 4 people. Maybe a little more if you have little kids or you are not big eaters. Everyone here is a big eater. Could explain a lot of things!! LOL!! Do you put both halves of cheese stick in one present roll – if not – why 16 sticks?? One per roll. That is error on my part. It should read 8 mozzarella sticks cut in half. Sorry about that I am correcting that right now. Cut in half length wise so it is still long? No cut in half the other way. Sorry about the delay. I have been a little under the weather. Are these good cold? I’d like to take to an office party but would have to cook the night before. Thanks! Sorry but I did not want you to be disappointed!!! Can these be made ahead and then cooked? I am sorry I don’t think these would hold up being prepped ahead of time. Unfortunately crescent roll dough does not hold up to that. Thank you. They are delicious!! Could I make these and freeze them for afternoon snacks? You know I have not tried so I hate to state one way or the other. Please let us know if you try. I will add the results to the recipe.